Wednesday the 20th of April is the 104th Deathiversary of Bram Stoker, author of Dracula. Every year I commemorate his birthday and death day. Last year I went to the newly resurrected pancake restaurant appropriately named Stokers. This year I decided to make my own pancakes in honour of Bram. Pancakes are filled with mythological and folkloric meanings. They are most commonly associated with Shrove Tuesday and Lent. Their circular shape associates them with the sun and they are often eaten at the end of winter to welcome the coming spring. They are symbols of the beginning and the end of life. I remember eating pancakes at funerals and I remember new mothers being given pancakes after childbirth. With their links to life, death and the sun, pancakes are the perfect food to honour an author whose greatest character was deeply connected to life, death and the sun. The pancakes below are unusual as they are leavened with yeast. 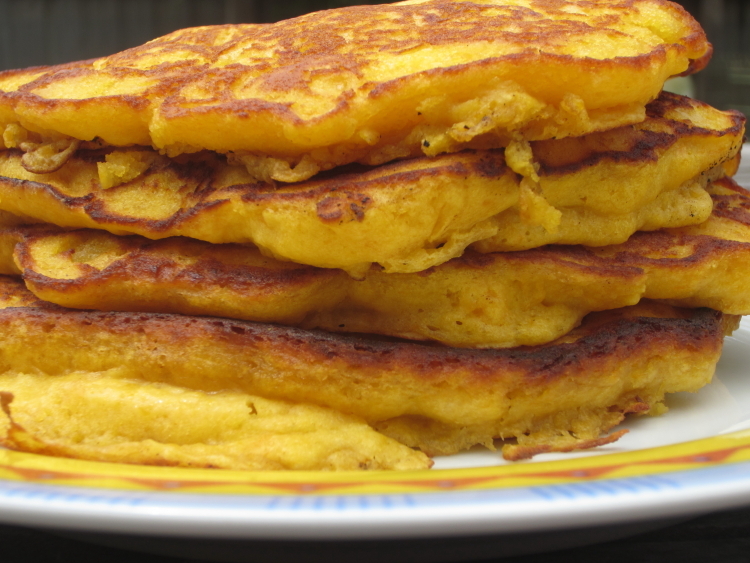 Yeasted pancakes are common in Eastern Europe, especially in Transylvania! They can be eaten with savoury or sweet fillings. I have chosen a classic combination of strawberry jam and cream, not only because I love the flavours, but because the colour combination has a vampiric feel for me – perfect for Mr Stoker. Add the flour to a large bowl. Add the egg, butter and oil and mix until they form a smooth pancake batter. Add the salt and yeast and stir until combined. Cover with plastic wrap and allow to sit in a warm place for 1-3 hours or until doubled in size. Heat a small amount of oil in a non-stick frying pan over medium-high heat. Pour in approximately 1/4 cup of batter. Cook for 3-4 minutes or until it starts to form bubbles. Flip and cook for a further 2-3 minutes or until golden brown and cooked through. The walnut pancakes with side orders of bacon and hash browns were my favourite. Sadly they’ve changed the menu for summer and the latest pancake offering is okay, but not fantastic. This made me think – why don’t I make my own pancakes when I get home? I’ve made buttermilk pancakes before, which were delicious, but I wanted something different. The first flavour that came to mind was pumpkin pancakes. The only problem was my partner Paul doesn’t particularly like pumpkin. 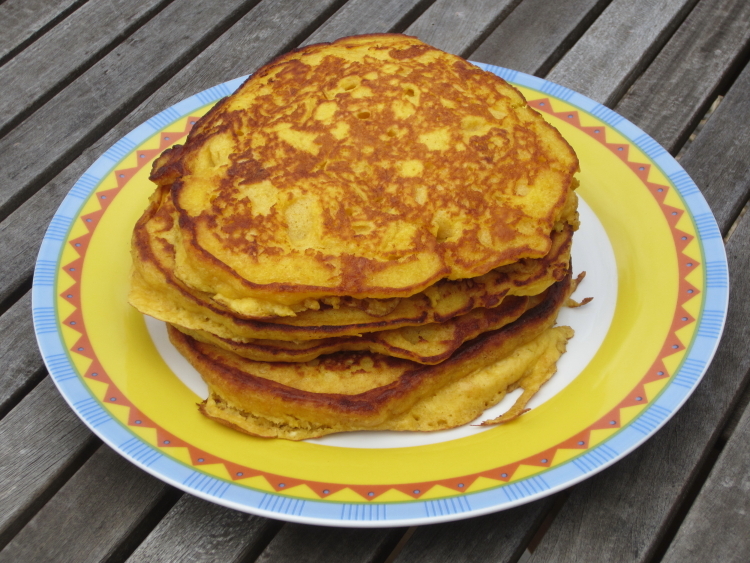 I didn’t want to make a batch just for myself because I knew I would eat them all 🙂 How could I tempt him to try pumpkin pancakes? There was only one way – add them to my cookbook. As my main taste-tester he could hardly refuse! Preheated our oven to 180C / 350F. Removed pumpkin seeds from pumpkin and kept them aside to make pepitas. Cut the pumpkin into pieces and placed in a baking tray. Sprinkled lightly with olive oil and baked until cooked. When cool enough to handle, we removed the skin from the pumpkin and discarded it. We mashed the pumpkin with a potato masher until smooth and refrigerated it for the next day. To make pepitas, we separated the seeds from the remaining pulp surrounding them. Rather than discard this pulp, we thought we’d try baking it too. We preheated the oven to 200C / 400F and lined two baking trays with baking paper. Whisk together the buttermilk, pumpkin, egg and butter in a large bowl until combined. In a separate bowl, add the flour, sugar, baking powder, bicarbonate of soda and salt and mix until combined. Allow to rest for 5 minutes. Heat some butter in a non-stick frying pan over medium heat. Pour in 1/3 cup of batter. Cook for 1-3 minutes or until it starts to form bubbles. Flip and cook for a further 1-3 minutes or until golden brown and cooked through. Well I’m happy to say that both Paul and I loved the pancakes! Paul had his with butter and maple syrup and I had mine with sour cream and crispy fried prosciutto. Naturally we tried each other’s to see which was best. I loved my savoury ones but I think Paul’s sweet ones were better. We can’t wait to make them again. If you make them let me know which topping you prefer – sweet, savoury or both! !